A project I’m involved with is also set to migrate to Drupal from a custom CMS. The group running the project had initially thought of using another custom CMS but I told them that we might be better off using Drupal and taking advantage of its myriad of features and modules that extend functionality as well as its development cycle. With a custom CMS, development stops after deployment since support and improvement are limited to several months after the launch, or as long as the contract stipulates it to be. With a closed source CMS, I warned the group, we’ll be stuck on the version installed for us on contract delivery date. So here I am, trying to learn Drupal. I’ve been playing with the CMS for months already and this I can tell you, it’s learning curve is really steeper. I’ve already deployed a couple of Drupal sites, some of them installed only for experimenting with the CMS. Others are just out-of-the-box installations with a few modules and a customized theme. Changing a CMS theme or template to fit your design is probably the first customization task for any website. My initial impression for Drupal is that customizing a theme would be very difficult. I was wrong. It is as easy as customizing a WordPress theme and anyone with average skills in CSS and HTML can do it. In learning how to customize a theme, the video tutorials of Elliott Rothman of The Art Lab are really helpful. His video tutorials are hosted on the Drupal School over at Blip.TV. Rothman also hosted previous video tutorials, including one on how to port and HTML/CSS design into a Drupal theme, in his Dudertown website. 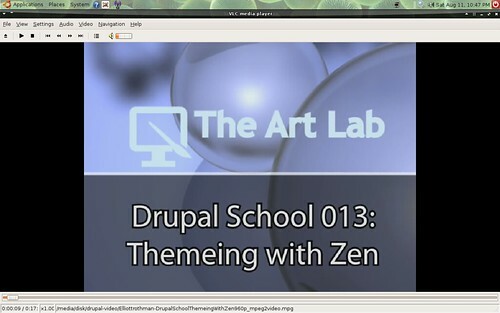 Here’s one of Rothman’s great tutorials on customizing a Drupal theme. Rothman’s series of tutorials are really good and very easy to follow. I’ve downloaded all his tutorials and might burn it on a DVD so that I can watch on TV while I follow it on my PC. There’s another good Drupal tutorial, this time on using the content construction kit (CCK) here. I find CCK a bit hard to figure out and the tutorial really did a lot in making me understand it. Another site that has been particularly helpful in my quest to be a Drupal ninja is this series on IBM: Using open source software to design, develop, and deploy a collaborative Web site. The developers used Drupal in running the site and the articles discussed how they did it. Any other good Drupal tutorials out there? Drop me a line, I sure need all the help I can get. Can you tell me if and where I can download the newspaper-wp theme, i saw it in the sandbox. It’s for a Dutch site. Yeah, you better have a really good reason/project to resort to using Drupal. For anything less than a knowledge/news sharing site, better stick to simpler systems. I’m sorta bitter since Drupal kicked my arse when I first encountered it. Heh. I have never been really able to release this newsportal theme but I might do so once I finish my new WordPress theme for news websites. Thanks for the link. The post is useful. Max, I think your theme is really something for a newssite with the headlines. Can’t I use some things you made? Perhaps I can make it work. Or together? Looking forward to your article on using wordpress for a news site. Hi, Im bryan from cebu, actually i stumble upon to your site while im searching for drupal video tutorial, this is great site for all drupal lovers here in cebu. Im just a web designer dont know drupal yet. wakeke.. Thank you for the post, great help..